A novel instrument that has already proven its mettle on field campaigns will attempt to measure atmospheric greenhouse gases from an occultation-viewing, low-Earth-orbiting CubeSat mission called Mini-Carb early next year—marking the first time this type of instrument has flown in space. Emily Wilson, a scientist at NASA's Goddard Space Flight Center in Greenbelt, Maryland, is teaming with the Lawrence Livermore National Laboratory, or LLNL, to fly a smaller, more ruggedized version of her patented mini-Laser Heterodyne Radiometer, or mini-LHR, on an LLNL-built CubeSat platform early next year. Wilson has demonstrated the ground-based mini-LHR during several field campaigns in Alaska, the Amazon River Basin, and the Royal Observatory in Edinburgh, Scotland, among other locations. Highly portable, the mini-LHR is comprised of commercially available components and literally can go anywhere to gather measurements. Although NASA is currently measuring carbon dioxide from space, the agency has never flown a laser heterodyne radiometer to do the job. Laser heterodyne radiometers were adapted from radio receiver technology. In this variation, the concentrations of greenhouse gases are found by measuring their absorption of infrared sunlight. Each absorption signal is mixed with laser light in a fast photoreceiver within the instrument and the resulting signal is detected at an easier-to-process radio frequency. While this is similar to other absorption techniques, such as those used in the Orbiting Carbon Observatory-2, laser heterodyne radiometry offers higher spectral resolution as well as improved signal-to-noise levels due to the internal mixing of sunlight with laser light, Wilson explained. Other advantages are that the mini-LHR is more compact and includes no moving parts, Wilson added. Furthermore, the instrument can measure three greenhouse gases: in addition to carbon dioxide, her instrument can simultaneously measure water vapor and methane in Earth's atmospheric limb. "And comparatively speaking, the instrument cost a small fraction to build compared with more traditional, non-CubeSat instruments," Wilson said. "This is the epitome of science on a shoestring." 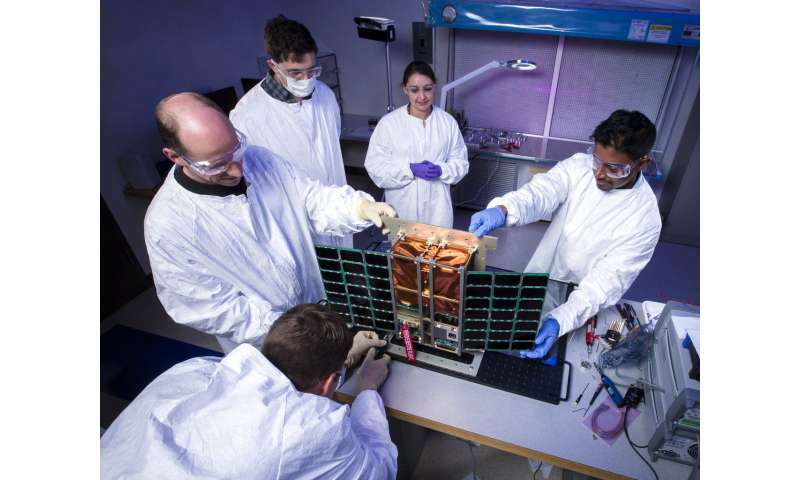 About the size of a toaster, the flight version of her instrument will fly as the only payload on LLNL's new, 11-pound 6U CubeSat bus known as the CNGB—short for CubeSat Next Generation Bus. The CubeSat Office at the National Reconnaissance Office originated the CNGB concept, funding researchers at LLNL, the Naval Postgraduate School, and the Space Dynamics Laboratory to develop a government-owned nano-satellite architecture that could support a broad range of missions. Mini-Carb is the first mission to do so. "Emily had a payload without a satellite and we had a spacecraft without a payload," said Vincent Riot, an LLNL engineer who helped develop the CNGB bus, which offers users a plug-and-play capability that allows for rapid configuration and integration. "That's where this partnership formed. This is a proof-of-concept mission to show that we can do excellent science with our platform," Riot said. The debut flight of both Wilson's instrument and LLNL's CubeSat is slated for January 2019 through the Air Force Space Test Program. 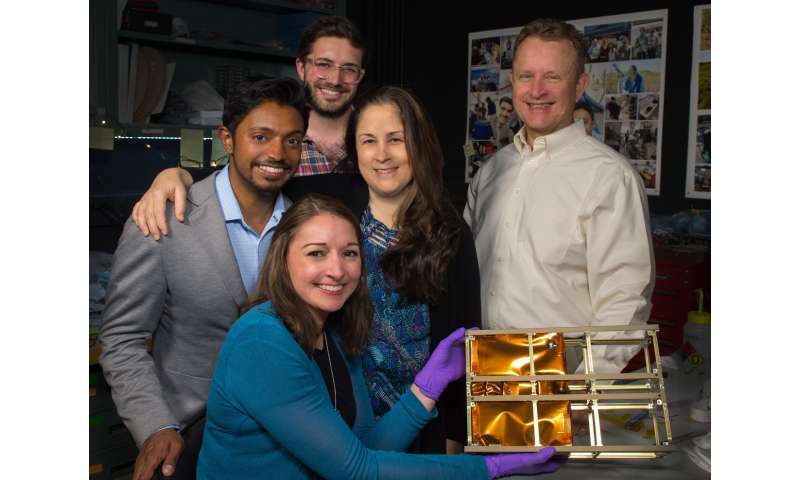 Wilson and her team recently delivered the instrument to LLNL where they helped integrate the instrument into the spacecraft in preparation for flight. Once in orbit, Mini-Carb will observe the region between the upper troposphere to the lower stratosphere between six and 18 miles above Earth's surface. Measurements in this atmospheric region provide important information about stratospheric circulation and how it responds to increasing greenhouse gas concentrations. "Measuring stratospheric circulation and its variability are essential for projecting how climate change will affect the stratospheric ozone," Wilson said. Scientists believe that the projected increases in methane and carbon dioxide this century will affect several physical processes that drive climate change, she said. Methane, which is especially long-lived, results in the increased production of stratospheric water vapor and hydroxide, which directly affects ozone, the layer that protects Earth from harmful ultraviolet radiation. "Because of methane's role in the changing chemistry of the ozone layer and because of its long lifetime, methane measurements are especially valuable," Wilson said. Like its ground-based sibling, the Mini-Carb instrument is made of commercial parts and operates passively—that is, it collects sunlight that has absorbed the targeted greenhouse gases. That light is combined with laser light tuned to the infrared wavelengths and then amplified. Through a series of other steps, the instrument can reveal the concentrations of the greenhouse gases contained in the atmosphere. While Wilson originally developed both the ground- and space-based instruments for studying climate change on Earth, the instrument also could be employed on a probe or lander to study the atmospheric conditions on other planets, she said. The immediate goal, however, is demonstrating Mini-Carb in space. "If we get one measurement, I'll consider it a success. There is potential for an extension if the mission works," Riot said. "If this works, our success could lead to bigger projects down the road," Wilson added. "This is a very big deal for us."